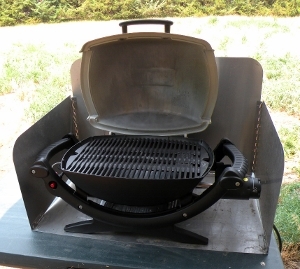 Why a new Weber Grill? Yeah I can hear you; "Didn't you say that the last one was the right one?" Well, it kinda was... right up until... on more than one occasion the wind and the grill had an argument and ultimately, that Coleman grill lost. Parts on it got too bent and battered to function any more. Left me with no choice but to go grill hunting again. So... guess where I found it's replacement? uh huh... Bass Pro. 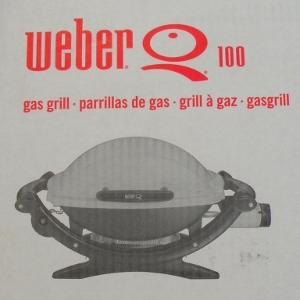 I went there to find a replacement Coleman camping grill and lo and behold, they had a rapidly shrinking stack of these lil' Weber Q100 grills. It didn't take but maybe two minutes to make this decision. I'd seen one or two in camps around... and now that we've been carrying it for several months... it's rapidly becoming, and for good reason, one of the most common units we see. They're a bit more costly than the Coleman brand but I believe it's more than made up for by the solid, quality, cast aluminum construction and the pure function of 'em. 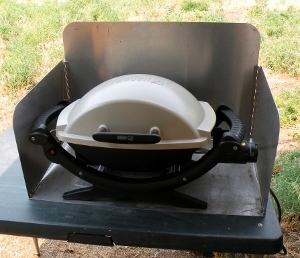 Unlike the Coleman, this Weber Grill can have the lid closed when you're grilling which holds in a lot of heat. Combined with my Grill Guard, it makes it work suh-wheet! The wind is no longer an issue cooking supper. Protected in that Grill Guard this BBQ will cook when it's too chilly for me to stand there with it! 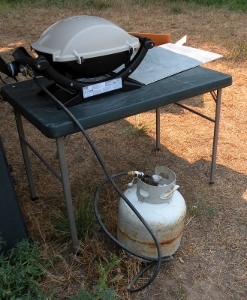 The grill can use either the throw away canisters or with the purchase of the proper connection hose, you can use a 20# bulk propane bottle. With a T fitting you can even run the Weber along with your Coleman stove. If you set up such and outdoor camp kitchen, having the bulk bottle saves a lot of running out with a steak half cooked or a pot of coffee half brewed. Though it's not as compact as the Coleman was, it still fits in one of my truck mounted cargo boxes with little trouble.